It’s rare for a small, community-based hospital to offer all of the sophisticated medical services typically found in a big-city cancer center, but that’s exactly what is available at the NorthBay Cancer Center, according to Lori Muir, director of Oncology Services for NorthBay Healthcare. Above: A trio of oncologists at NorthBay Cancer Center share a background of training and service in the Air Force. They are: Jessica Powers, M.D., James Long, M.D., back row left, and Jonathan Lopez, M.D. A self-avowed “math nerd,” James Long, M.D., was initially focused on a major in physics at the University of Texas when he realized he didn’t want to spend his life in a lab. And, later, when his father suffered from heart disease and a stroke, the idea of helping others became further cemented in his mind. After receiving his medical degree, Dr. Long did a residency in internal medicine at Wilford Hall Medical Center at Lackland Air Force Base in San Antonio. He was interested in cardiology when he had an epiphany. A fellowship training in hematology and medical oncology came next, in a combined program between the Air Force and the University of Texas. He was transferred to David Grant U.S. Air Force Medical Center in 1990. Oncology and hematology allowed him to deal with virtually every organ in the body. It offered the hope of an actual cure for some diseases and active research for all the others, he said. Jonathan Lopez, M.D., hematologist/ oncologist with the NorthBay Cancer Center, made a simple choice when pursing his career: Enlist in the U.S. Air Force and get educated. His first job was as a pharmacy technician, but then he elected to go through medical school at the Uni- formed Services University of Health Services in Bethesda, Maryland. His intention was to become a primary care physician but all that changed during his six-week rotation in hematology/ oncology. An encounter with a patient opened his eyes to the significance of compassion and communication. As she became more comfortable, the patient allowed Dr. Lopez to listen to her heart and lungs and to ask a few medical questions. He noticed that she had a prosthetic leg and on it was a band aid. When queried, the patient told him her mischievous grandchildren had scuffed it up, so she put a band aid on it to prevent the scuff from snagging her pantyhose. Jessica Powers, M.D., hematologist/ oncologist for NorthBay Cancer Center, knew from an early age that she wanted to be a physician. So, she joined the Air Force’s Reserved Officers’ Training Corps (ROTC) when she enrolled at the University of Virginia. ROTC cadets agree to a four-year active duty assignment in exchange for having college paid for. 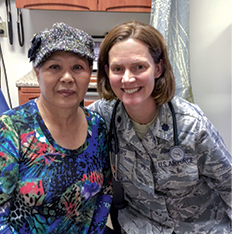 After graduating from medical school, she was promoted to captain and did her residency in internal medicine and then a three-year fellowship in hematology and medical oncology at Wilford Hall Medical Center at Lack- land Air Force Base in San Antonio. Dr. Powers pauses to share a moment with a favorite patient she was treating in 2016 at David Grant Medical Center.